Read the dials from left to right. When the pointer lies between two numbers, record the small number. If the pointer is directly on a number, look at the dial to its immediate right. If that pointer has not passed zero, write down the smaller number. Just subtract the previous reading from the new reading and you will know how many kilowatt hours you have used. Notice that your residential water meter has only one dial. 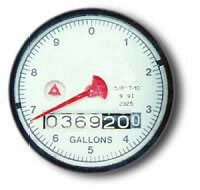 The dial has a sweep hand that measures water usage in gallons. One complete revolution equals ten gallons of water used. The odometer-type register in the middle of the dial registers the hundreds of gallons used. 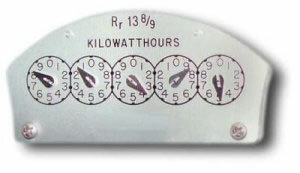 To read the meter you record the numbers from the odometer-type register. Since the odometer registers in hundreds of gallons you do not record the last two numbers. (The last number is a permanent number and the next dial registers tenths.) The remaining dials register the actual (in hundreds) water used. Subtract the previous reading from the new reading and you will know how may hundreds of gallons of water you have used.